Well, seems like LulzSec has returned, and moved beyond the DDOS attack! Not content to merely shut down one of Rupert Murdoch's paper's websites, the hacking group has instead planted a bizarro-Onionesque account of the mogul's death-by-palladium on a Times redesign page masquerading as The Sun. Well played, #AntiSec. 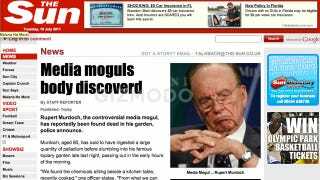 Murdoch's papers of course, and several of his lieutenants have been implicated in the massive hacking scandal that began to unfold earlier this month. Murdoch is scheduled to appear before the British parliament tomorrow. "We found the chemicals sitting beside a kitchen table, recently cooked," one officer states. "From what we can gather, Murdoch melted and consumed large quantities of it before exiting into his garden." One detective elaborates. "Officers on the scene report a broken glass, a box of vintage wine, and what seems to be a family album strewn across the floor, containing images from days gone by; some containing handpainted portraits of Murdoch in his early days, donning a top hat and monocle." Another officer reveals that Murdoch was found slumped over a particularly large garden hedge fashioned into a galloping horse. "His favourite", a butler, Davidson, reports. Update: The Times dummy page has finally been taken down—and visiting TheSun.co.uk will redirect you to the LulzSec twitter page—but will stay up indefinitely here on Gizmodo. Also, the email logins of major News of the World players—including former top News Corp exec Rebeka Brooks—have begun trickling out.